Your privacy is extremely important to us. And, frankly, we're not stupid. We know that if we abuse your trust, you won't come back. That's why we're very serious about your privacy. Any information provided to us (including personal details, contact information, interests, subscriptions, etc.) is held in the strictest of confidence, and no such information is ever revealed, given or sold to any third parties whatsoever. Credit card details stored for recurring purchases (such as subscriptions) are stored in encrypted databases. Credit card details provided for one-off purchases are not stored at all. We have a strictly ZERO-TOLERANCE ANTI-SPAM policy. (We really hate the stuff -- it costs us a fortune in extra web hosting fees.) If you provide us with your email address (such as for the Newsletter, when Enrolling in workshops, or when making software purchases), rest assured that we will never reveal it, sell it, loan it, spam it, abuse it or forward it. It's yours, it's private, and we respect that. If you ever want to be removed from our email list (we can't think of a reason why, but ya never know), simply respond to an email with the word REMOVE in the subject line. 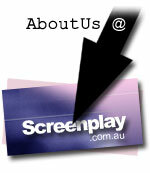 Any stories, ideas, or screenplays that are submitted to Screenplay.com.au, or any of its employees or associates, or discussed or presented in workshops or with mentors, are bound in confidence by internal privacy contracts. We do not share your screenplay or story with anyone, without your express written consent. Naturally, where others are present (such as in workshops), we cannot control their actions, but we do our best to foster a respectful environment where writers' ideas and creative work can be allowed to flourish. Screenplays submitted for Coverage are held in confidence, and only the Coverage itself (and only if favourable) is forwarded to production companies through the Screenplay Notification Service, and only if you explicitly agree to it after reviewing the Coverage itself. No one ever has access to your screenplay without your permission. We're very serious on the issue of privacy and confidentiality, and welcome any queries on the issue.